Cinnamon buns, cinnamon rolls (whatever you call them): just when you thought they couldn’t get any better, you find a recipe like this. I got the idea to add fruit to cinnamon buns for a roasted banana cinnamon bun recipe I found around Father’s Day and made for our Father’s Day breakfast. The filling was out of this world, but the recipe suggested one use canned Pillsbury french bread dough, a suggestion I took even though I knew I should have known better. Lesson learned. 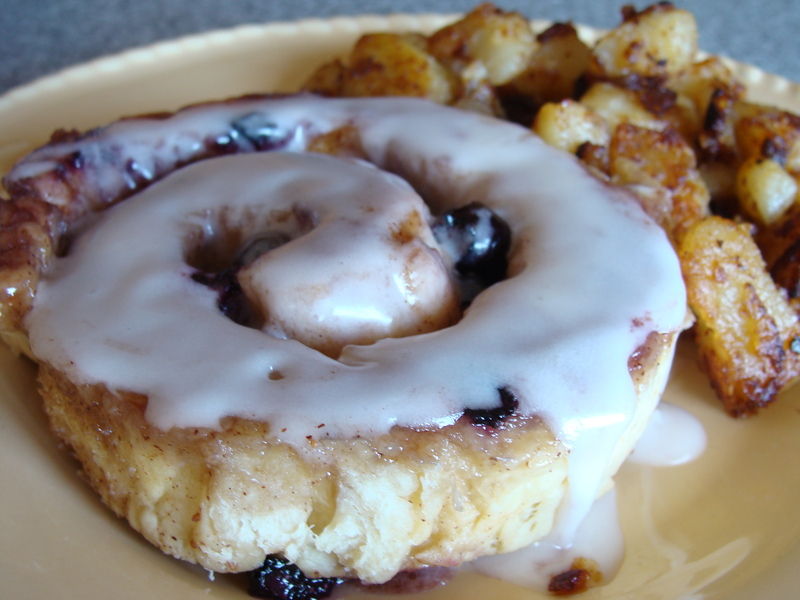 On a recent day off, I treated myself to a nice morning of sleeping in and preparing a tasty breakfast (brunch, really) spread of sweet blueberry cinnamon buns and crispy, salty homefries. This time, I made my own dough. I’ve done this before with varying degrees of success. Yeast doesn’t like me all that much, you see, and often decides not to work–despite being newly purchased, stored in a warm place, and married with liquids of a proper temperature–just to spite me. Usually my cinnamon roll dough doesn’t rise. It still tastes good, it’s just kind of thin and more pastry than bread. But this one rose, yay! All joking aside, dough-making is very temperamental and if you want to use the Pillsbury dough instead I will not mock you–I will only suggest that you use two tubes of the stuff. And as for the homefries–what can I say? I like my homefries crispy, salty, full of onion flavor, and just barely tasting of potato, so I find these perfect. They are not quite as good as my dad’s–he makes the BEST homefry style potatoes–but they are pretty darn close. An overall excellent breakfast (and life) choice. In the bowl of a stand mixer fitted with whisk attachment, combine 2 C of flour, salt, sugar, and yeast, mixing well. In a small saucepan (or glass measuring cup and the microwave), heat milk until it reaches the temperature recommended on the back of the yeast packed, usually 110-130 degrees F. Add milk and melted butter to dry mixture and beat on low to combine. Add eggs one at a time and beat until fully incorporated. Remove whisk attachment from mixer and attach dough hook. Add all but 3/4 C of the remaining flour and knead on low for 5 minutes, or until dough is no longer sticky. Add more flour if necessary. Turn dough out onto floured work surface and knead by hand for 30 seconds. Lightly oil a large bowl and store dough in bowl, covered with plastic wrap or a damp dish towel, until dough has doubled in volume, 2-2 1/2 hours. While dough is rising, combine brown sugar, cinnamon, and salt in a medium bowl. Mix well and set aside. Once dough has risen, remove from bowl and roll into an 18″x12″ rectangle (the long side should be facing you). Brush dough with melted butter, leaving about a half an inch of space along the top seam. Sprinkle filling over dough, leaving about a 3/4″ boarder at the top. Sprinkle blueberries over filling and press lightly into dough and sugar mixture, mashing gently with a fork if desired. Roll the dough into a tight cylander, beginning with the side closest to you and rolling upward. Pinch the seam and roll the cylander so that the seam is facing down. Squeeze gently to create a constent thickness throughout. Using a serrated or very sharp knife, cut cylander into 12 pieces. Arrange in a greased 9″x13″ baking dish, cover, and let rise for 30 minutes. Preheat oven to 350 degrees F. When rolls have risen, uncover and bake 25 minutes, or until golden but slightly gooey inside. Let cool and cover with icing, which can be made by combining 2 C of confectioner’s sugar with milk or water, which should be added a few drops at a time until a thick glaze is achieved (think the consistency of the icing that comes with the Pillsbury cinnamon rolls). Cook potato(es) in microwave or oven until just the slightest bit underdone. Let cool, remove skin, and large dice. Heat 1 Tbsp. vegetable oil in a medium skillet over medium heat. Add onions and sautee with a pinch of salt until translucent. Raise heat to medium high and add potatoes, sprinkling with chili powder and 1 tsp. salt. Allow potatoes to cook (without touching!) for at least five minutes, or until they have developed a very crisp bottom layer. Flip and repeat on opposite side. Flip again or add more oil if a crunchier texture is desired. Remove from heat and sprinkle liberally with additional salt before serving. 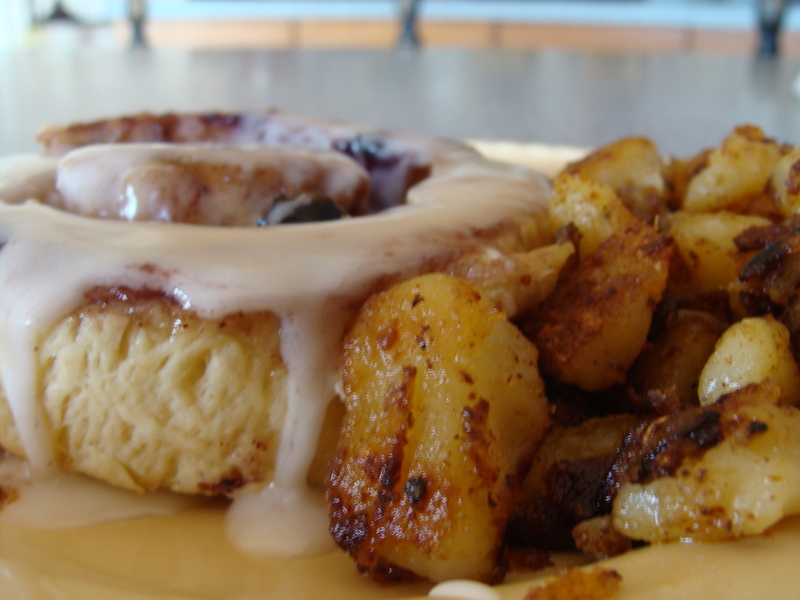 Yum, cinnamon buns + fruit sounds good. Those cinnamon buns look amazing!